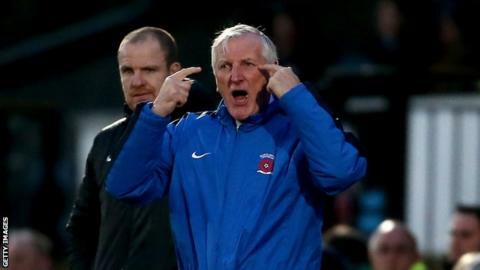 Hartlepool United manager Ronnie Moore says his side should not get carried away after winning their first four matches of the season. Pools, who have conceded just one goal so far this term, will face Teddy Sheringham's Stevenage on Saturday. "You cannot do better than four wins but now the expectation on us becomes massive," Moore told BBC Tees. "Everybody expects us to win, even the players, who are full of confidence. But we haven't done anything yet." Moore has turned Hartlepool's fortunes around since his arrival at the club last December when they had won just three times in 20 games, and saved them from relegation to the National League. "We're now on nine points when we were on just 11 points in November last season, which shows you the turnaround. But no one is getting carried away, that's for sure," Moore added. "We couldn't keep a clean sheet for fun last season but we've worked on the back four and it's nice to see that at least we've taken that on board as we've got three clean sheets in four games." But Moore, who added defender Andrew Boyce on a one-month loan from Scunthorpe United to his squad, wants more options at the back after losing Harry Worsley for at least two weeks with an ankle injury. He said: "Dan Jones is now back from injury and covers us at left-back as well as centre-half, but if one of the centre-halves gets injured, we are going to be in trouble so we definitely need another defender in."